It’s impossible to scroll through the Facebook newsfeed without running into an ad every few statuses or so. Love it or hate it, FB’s nailed down creative DIY ads. Facebook ads allow you to get creative with lots of different formats, and best of all? Their algorithm does the heavy lifting for you in terms of getting your ad in the right place (phew), making sure the right audience sees it. So again, you can love it or hate it, but you might as well use it. 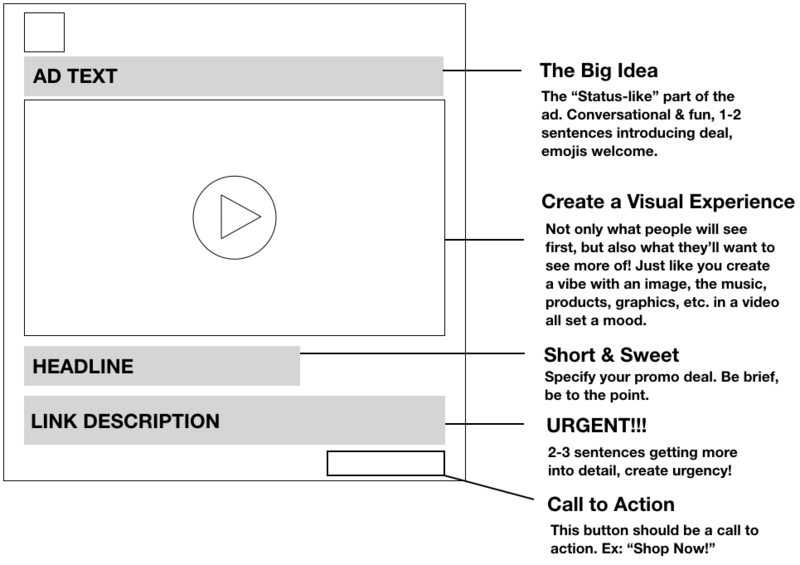 Learn the anatomy of an amazing Facebook ad and how to use this method to boost your sales and your Shop visits! Note: If you’re not sure how to even start an ad, hop on over to our previous ad guide first! There you’ll find helpful tips on setting up a FB Page, how to start an ad, etc.! There are lots of different choices concerning ad objective; that is, what you want an ad to achieve for you. In this post, we’re going to focus on ads that help you make more sales (fingers crossed!) and track them. This would be the “Conversions” ad type. Reach the right people (including new people as well as people who have actually visited your site). Go to your Artist Shops Dashboard. Where it says “Facebook Pixel ID #”, select “Get your pixel“. Your pixel ID will be in the upper lefthand corner of the screen (and heads up: you can ignore the “Create Custom Conversion” button in the middle of the page). This page is where all the magic (data) happens. Click “Data Sources” near the top to see more information about activity in your Shop. Go back to your Settings and past your Pixel into “Facebook Pixel ID #”. 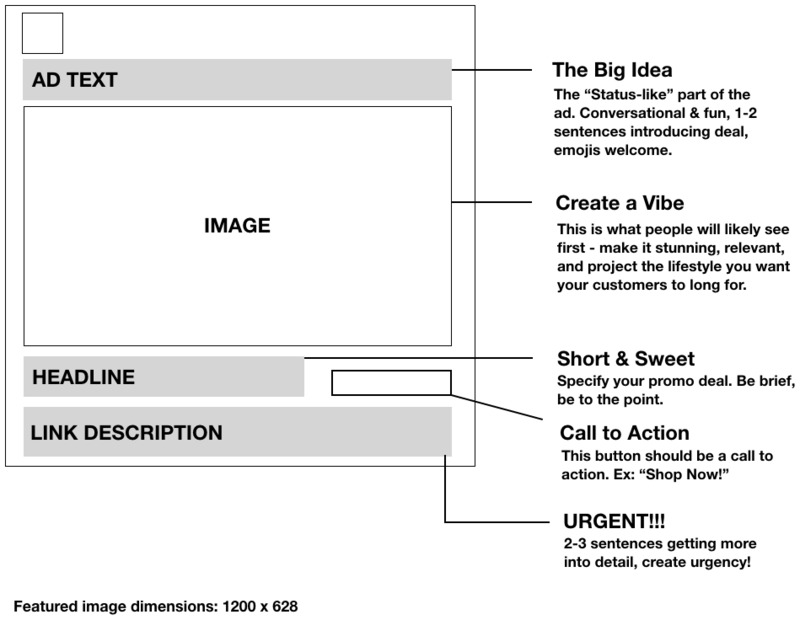 View Content – this will tell you each time a customer views any page in your Shop. Add to Cart – this event tracks each time someone adds a product to their cart. Purchase – this will let you know when someone purchases a product. In your Facebook Pixel Dashboard – that page you got whisked away to when you hit “Get your pixel” – is where the data magic happens. You’ll be able to measure how many ‘events’ (viewing content, adding to cart, or purchase) occurred on a specific URL (product URLs, your homepage URL, etc.). You won’t be able to see which items were specifically purchased, added to cart, etc., but this will help you see which of your designs are getting the most hits and if your ads are increasing events on your Shop. And that’s huge! 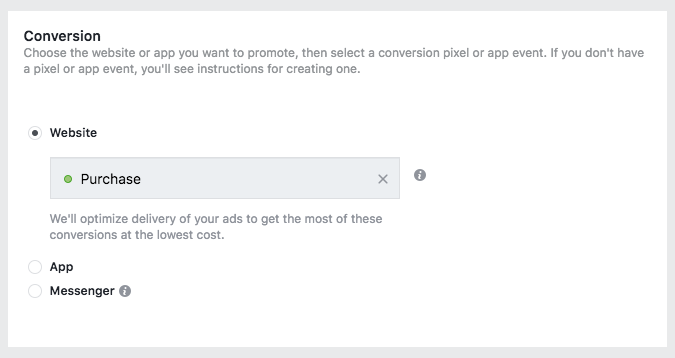 Once you’ve set up your Pixel in your Dashboard, go back to setting up your ad. As a Shop owner, you know that appealing to your specific niche audience is a good idea when it comes to social, copy, etc. But when it comes to ads, when you’re just starting off broader. is. better. Instead of targeting fans of The Fifth Element movie in Galena, Illinois, start a little (or, in that case, a lot) bigger. To start out, your audience should be at least 1 million strong or more. In the case of Facebook ads, specifying what audience you’re looking for can actually increase your audience size while still keeping it interest- and demographic-specific. In the ad setup window, you can specify your audience by demographics, age, interests, location, even relationship status. 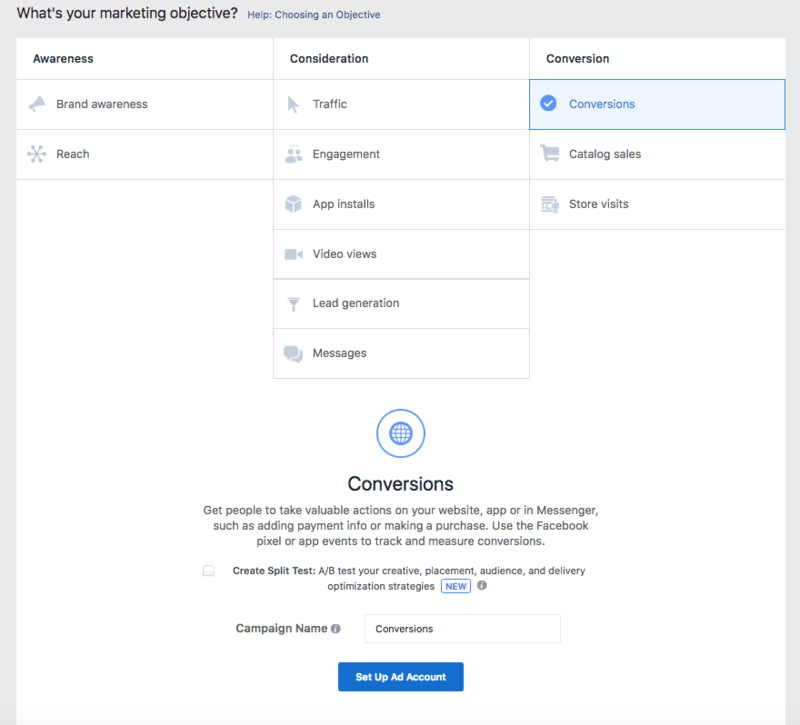 For an even clearer view of your targeting options, use Facebook’s Audience Insights tool. You also have the ability to create a custom audience based on visitors to your site. If your Shop is wildly popular or you just want to try out retargeting people who have visited your Artist Shop, feel free to give this a spin. But for now, we’re trying to get the most bang for our ad buck. Check “Automatic Placements” – the recommended way to go. Trust in Facebook’s algorithm to put your ad where it wants. If you let it do its thing, it will work to place your ads in the optimal areas. Edit or limit the placements and you’re limiting Facebook when it’s trying to do what it does best. You never know; you might get the most conversions from a Right Column ad! 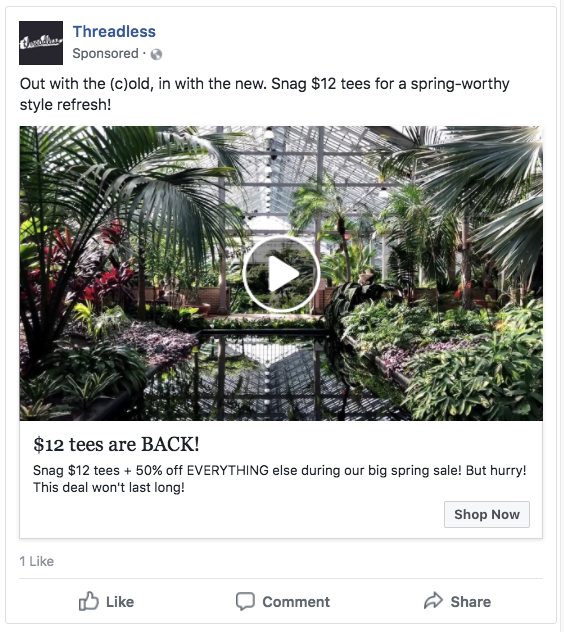 We’re going to focus on the four big types of Facebook ads: Single Image (the #classic choice), Single Video, Collection, & Carousel. Who are you trying to appeal to? Look back at the audience you specified for this ad! Is this image going to appeal to them specifically? Are the products, designs, the aesthetic, etc. going to appeal to them? What is your promo? Make sure the photo is relevant to the type of promo you’re running. If your ad is for a spring sale, make sure your images have spring/warming-up vibes; not winter imagery featuring long sleeves and fleece. Limited time only! Get tees from our $10 collection + 20% off everything else. Act fast while they last! There will also be the option to include a Call to Action button. We recommend selecting this – ‘Shop Now’ is always a good one to include. When it comes to social media, video is king. So much so that the American Marketing Association estimates that video content will be the driving force behind 85% of search traffic in the US by 2019. Social media marketers are starting to not-so-subtly glide over to video, meaning it’s time to start focusing on a video tactic NOW. Luckily, Facebook ads also come with video ad capability. As far as copy goes, the same rules apply here as they do to the single image ad. Make a quick video featuring product flat lays. Your video ad doesn’t have to be Oscar-worthy. In fact, marketer Aaron Zakowski recommends making videos that work even without someone turning on the sound. Make a quick video cycling through a few of your product flat lays from your Shop and end it with the name of your site/brand. Kind of like the GIF our designer Katie Lukes made for her Shop. Do a Timelapse WIP video set to music. Nowadays, our phones make timelapse videos very DIY-friendly. Shoot a WIP video of you creating a design in your Shop set to music, and end with your Shop name. Stop motion. If you think about stop motion and say “CHALLENGE ACCEPTED”, go for it! Stop motion is time-consuming, yes, but it’s a fun experiment to try. Try making a stop motion of a few of your t-shirt products snaking across the screen and lining up next to each other, even. You can even create stop motion videos out of still photos, like this example from Bucketfeet. Check out this LinkedIn tutorial for some helpful stop motion tips. Watch our Spring Style video on Facebook. This option is available exclusively for mobile, and for good reason. Not only does it look great on its own – it opens up into a full Canvas ad experience (see how it looks right here). According to Marketing Land, almost 80% of social media time is spent on mobile devices, with Facebook leading the way in terms of time spent on a social platform. So a tailored-to-mobile ad experience? Yes, please. As far as the initial FB ad you see, there’s less copy involved in this ad than in any of the others in this article. All you need is that ad text at the top (and here, you should include a little more information about your deal) and a little one-liner about your sale, like a more detailed headline. But – as you can see in the collection ad experience – you may want to add copy into images. 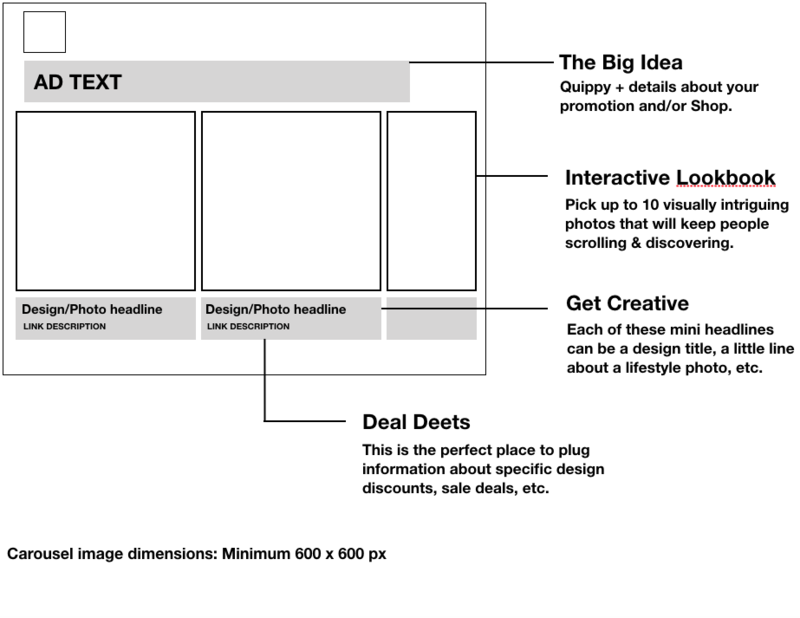 Sell products: grid layout: features your products front and center. Sell products: lifestyle layout: allows you to get a little fancier with featuring your products as well as multiple lifestyle photos. 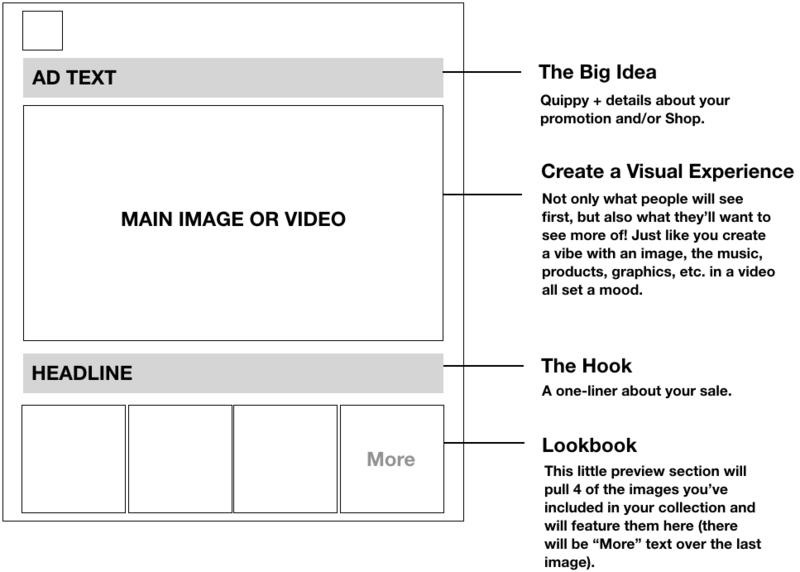 And if you don’t want to use a template, do it like we did and build your own! (See below – we used our video for this one as well.) One takeaway I’d give based on the collection ad we ran is if your main image features several products, include those products in the collection ad but don’t make them the first product images people see before they click on the ad. This way, if people see a design they like in the featured image, they have to click the ad to see more in order to find out which design it is. It’s a way of getting your foot in the door. Can’t choose what lifestyle image to feature? Why not use several! 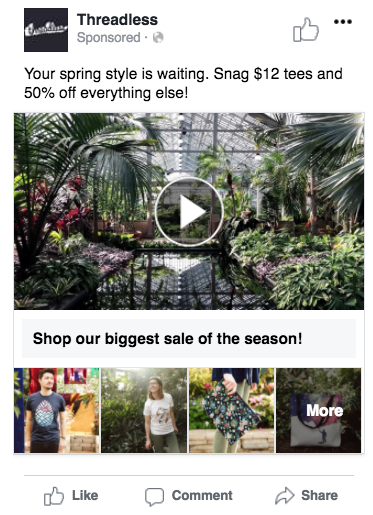 Sometimes less is more…but that’s not the case with FB carousel ads. Digiday & Kinetic Social reports that carousel ads drive a whopping 10x more traffic to websites. This is a solid way to feature even more images and products in an ad a la Instagram carousels. The biggest difference between this ad style and the previous ones is that you can have different copy for each image in your carousel. This allows you a little more creativity and to single out specific design titles. And your link description here should have your deal info (ex. “Only $12!”) earlier in the copy rather than later – the carousel images shorten the description copy. Short and sweet is better here. You can get REALLY creative with carousel ads. Just look at how they’re used here. You can have each photo be a section of one long panoramic photo, each photo can zoom in on the details of a specific product – there are endless possibilities here. Get creative! 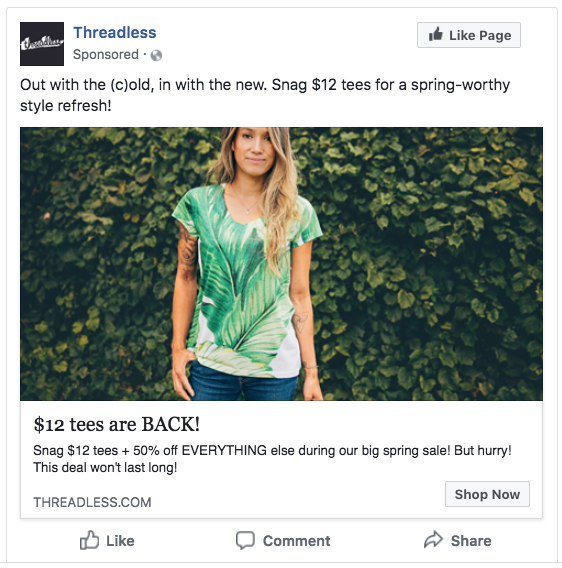 Delving into Facebook ads definitely takes some experimenting with, but it’s a great way to get your Shop and products in front of more faces. Give it a whirl!